For other uses, see Joel (disambiguation). 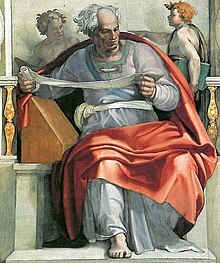 Prophet Joel as imagined by Michelangelo (Fresco, Sistine Chapel Ceiling, 1508–1512). Joel (/ˈdʒoʊəl/; Hebrew: יוֹאֵל‎ Yōw’êl; Syriac: ܝܘܐܝܠ‎ Yu'il) was a prophet of ancient Israel, the second of the twelve minor prophets and the author of the Book of Joel. He is mentioned by name only once in the Hebrew Bible, in the introduction to his own brief book, as the son of Pethuel (Joel 1:1). The name Joel combines the covenant name of God, YHWH (or Yahweh), and El (god), and has been translated as "one to whom YHWH is God," that is, a worshiper of YHWH. He is believed to have lived in the 9th century BCE, but the dating of his book is still debated. The book's mention of Greeks  has not given scholars any help in dating the text since the Greeks were known to have had access to Judah from Mycenaean times (c. 1600–1100 BC). However, the book's mention of Judah's suffering  and to the standing temple  have led some scholars to place the date of the book in the post-exilic period, after the construction of the Second Temple. Joel was originally from Judah/Judea, and, judging from its prominence in his prophecy, was quite possibly a prophet associated with the ritual of Solomon's or even the Second temple. According to a long-standing tradition, Joel was buried in Gush Halav. On the Eastern Orthodox liturgical calendar, his feast day is October 19. In the Roman Martyrology the prophet is commemorated on July 13. He is commemorated with the other Minor prophets in the Calendar of saints of the Armenian Apostolic Church on July 31. According to the Eastern Orthodox Christian hymns, the ancient hymnographer Anatolius links Joel’s prophecy to the birth of Christ. In Joel 2:30, he says that the blood refers to the Incarnation of Jesus Christ, the fire to the Divinity of Christ, and the pillars of smoke to the Holy Spirit. Joel is considered a minor prophet in the Baha'i Faith. In the Kitab-i-Iqan, Baha'ullah states that previous prophecies by minor prophets such as Joel have symbolic meanings and significance and therefore should not be understood literally. ^ "Commentary by A. R. Faussett". Jfb.biblecommenter.com. Archived from the original on 26 April 2009. Retrieved 26 August 2017. ^ "Gush HaLav". Jewishvirtuallibrary.org. Retrieved 26 August 2017. ^ "Prophet Joel in the Eastern Orthodox Church". Orthodox Church of America. Archived from the original on October 10, 2018. ^ Editor. "Roman Martyrology July, in English". Boston-catholic-journal.com. Retrieved 26 August 2017. ^ "Prophet Joel". oca.org. Retrieved 26 August 2017.